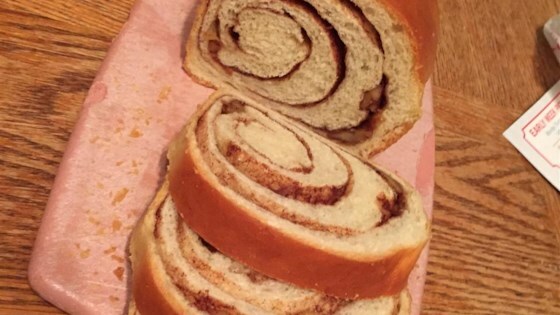 "This bread is probably the best thing I make. Just finished making it and half a loaf is gone already while it was cooling. Using the bread machine to make the dough makes it so easy!" Place milk, eggs, 1/4 cup butter, bread flour, sugar, salt, and yeast into a bread machine in the order recommended by the manufacturer, select the dough setting, and start the machine. When dough cycle is complete, transfer dough to a floured work surface and punch down. Let dough rest for 10 minutes. Mix walnuts, brown sugar, and cinnamon in a bowl. Divide dough in half and roll each half into a rectangle about 9x14 inches. Spread 1 tablespoon softened butter over the top of each dough rectangle and evenly sprinkle dough with half the walnut mixture. Roll dough rectangles, starting from the short ends, and pinch seams closed. Grease 2 9x5-inch loaf pans. Fit the rolled loaves into the loaf pans with seam sides down. Cover and let rise until nearly doubled in size, about 30 minutes. Bake loaves in the preheated oven until lightly golden brown and bread sounds hollow when tapped, about 30 minutes. If loaves brown too quickly, lightly cover with aluminum foil for the last 10 minutes of baking. Let bread cool for 10 minutes before removing to finish cooling on wire racks. Sprinkle tops of each loaf with 1 teaspoon confectioners' sugar. This is good. I coulding get the bread to go in 9x14 rectangles, so the swirl was more like a blobs but the two loafs did go fast. Will make again. Stellar! I didn't have walnuts, and kids don't like them anyway. I just used the cinnamon/sugar mixture and it was still fantastic. This recipe is awesome ! I'm new to baking bread but this was easy, came out great and tasted awesome.